The present investigation focuses on improvement in mechanical properties of AlSi5Cu3 aluminum alloy by in situ synthesis of TiB2 reinforcement particles. 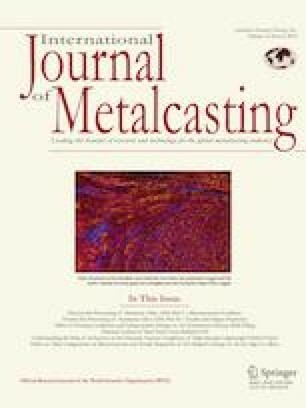 Stochiometrically calculated amount of potassium tetrafluoro borate and potassium hexafluoro titanate were used for the development of 3 and 6 wt% particles of TiB2 in the liquid metal. The melt having TiB2 particles was allowed to solidify naturally in the sand mold. X-ray diffraction (XRD) and scanning electron microscopy (SEM) revealed the formation of hexagonal TiB2 particles within the matrix. Microstructural studies concluded the formation of micron size TiB2 particles and reduction in grain size. Ultimate tensile strength increased from 21 to 64% and hardness increased from 30 to 50% compared to AlSi5Cu3 alloy due to the formation of 3% and 6% TiB2 particles, respectively. The authors gratefully acknowledge the support from Department of Science and Technology (DST), New Delhi, sponsored SMART Foundry Project (DST/TSG/AMT/2015/332 dated 17/08/2016).